I’ve copped to it in the past, and it’s still true: I secretly enjoy airline food. There’s something pleasing and special about getting served a meal 30,000 feet in the air. Pleasing, special, and absolutely necessary during long-haul trips! Perhaps I should rephrase, though: I enjoy the concept of airline food. In practice, it’s often difficult to literally enjoy the taste (Turkish Airlines’ yummy options being a rare exception). That was certainly the case with the vegan meals on SAS, aka Scandinavian Airlines. I first flew them in 2018 during my trip to Tallinn, which began with a long-haul leg from Washington Dulles to Copenhagen (and then a short meal-less skip to Tallinn). 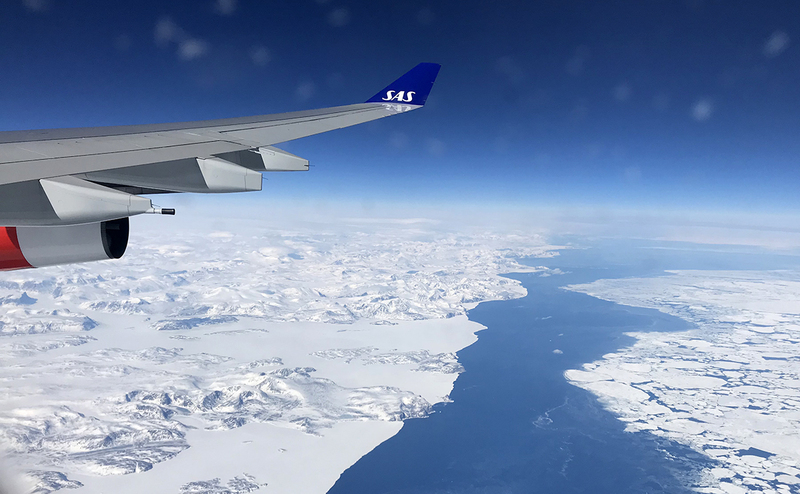 I flew SAS again last month for a stay in Copenhagen itself, taking the same flight from IAD to CPH and back again. 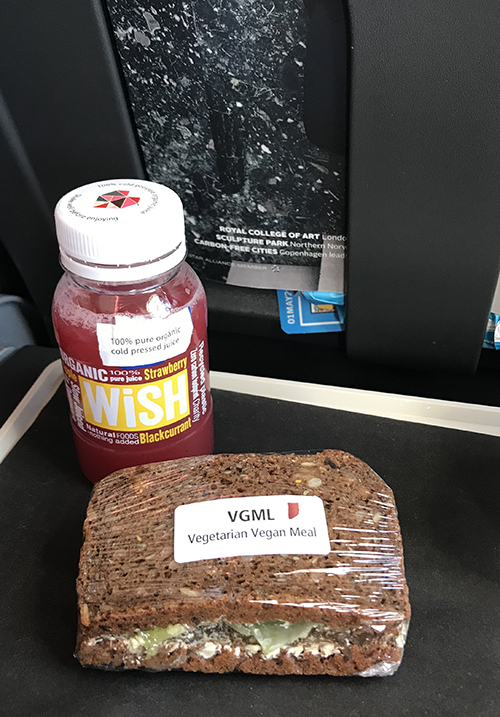 Both trips included nearly identical meals, so I’m pretty confident what I’m about to share with you is the standard offering on an IAD to CPH (and vice-versa) flight on SAS. Spoiler: It wasn’t great. Sad face! So, on to the food itself! On the 8-hour flight from D.C. to Copenhagen (and vice versa), you can expect two meals: dinner and a pre-landing snack. Let’s talk about dinner first. 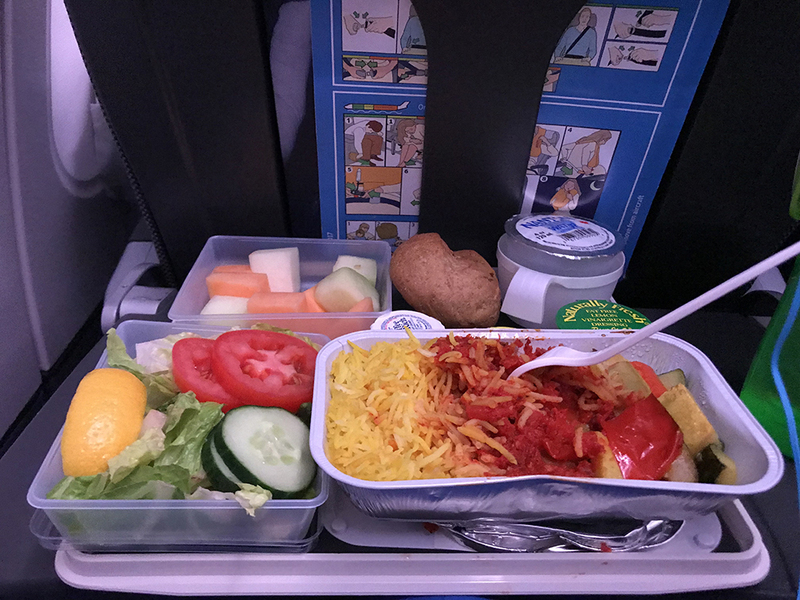 On the D.C. to CPH leg, I was treated (ahem) to a rice and veggie dish, served with the barest minimum of tomato sauce. The highest praise I can give this meal is that the rice was cooked well. Beyond that, there’s not much to say: The veggie portion was comprised mainly of flavorless zucchini and summer squash, alongside a few bits of tomato and onion. It was certainly edible, but not memorable, and the lack of protein meant it didn’t really stick. The main dish came with a somewhat respectable side salad (served with a lemon-balsamic dressing, meh), the ubiquitous fruit salad (flavorless honeydew galore, alas), and a decent bread roll with margarine. There’s also non-dairy (and vegan!) coffee creamer in this photo, though I didn’t use it. 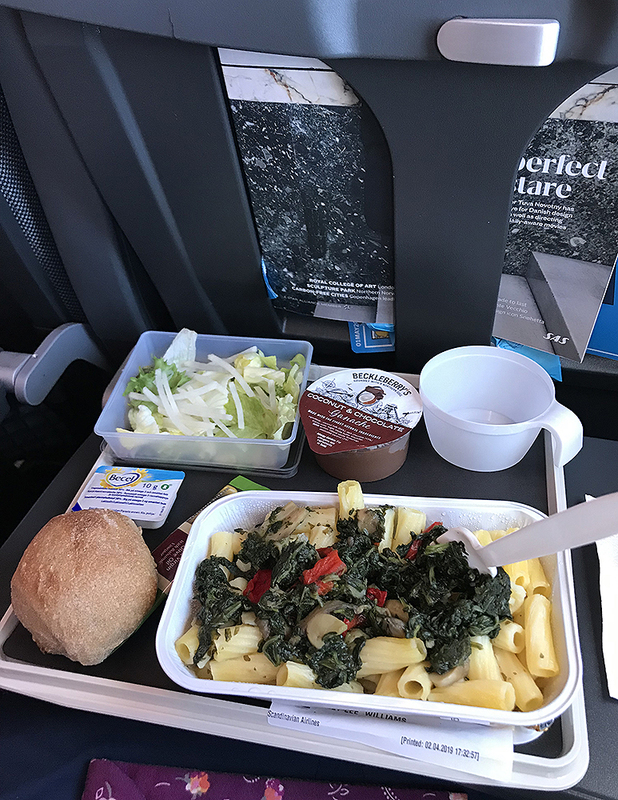 On the CPH to D.C. leg, I received a very unfortunate pasta dish. Unfortunate because (1) the pasta was overcooked and a bit gag-inducingly soft, and (2) the spinach-mushroom-tomato topping was simply flavorless. Ugh, what a textural nightmare! And look at that sad side salad. Whereas the previous salad at least had some color (and legitimately crisp lettuce), this one was so pale and limp and lifeless. And what are those bizarre pale sticks on top?! They had the texture of jicama but the flavor of nothing. Just sad. As was the dressing; that tube contains a vile, sweet, oily dressing that I hope never to encounter again. Even the roll was lackluster. (YMMV; the first time I flew this route, the roll was fine.) Redemption came in the form of dessert, a rarity on VGML orders. This chocolate-coconut ganache was legitimately delicious and legitimately rich, and I was so pleased when I saw it on my tray during the Copenhagen trip — I remembered how lovely it’d been from my last trip! It’s topped with toasted coconut flakes and truly makes up for the rest of this sad meal. Don’t expect anything quite so lovely on your pre-landing snack, however. Especially not on the IAD — CPH route! This meal includes applesauce (unsweetened if you get Lucky Leaf brand; sweetened if you get Mott’s), orange juice, a tiny sandwich, and either fresh fruit or a bag of extremely sweet dried fruit. And margarine, for some opaque reason. Maybe it’s meant for the sandwich? Butter would certainly improve it, because the sandwich is a big stack of nothingness, just bread stuffed with cucumber, tomato, lettuce, and some kind of flavorless spread. Seriously sad. The pre-landing snack on the CPH — IAD route is marginally better for one reason only: cold-pressed juice. Legitimately delicious strawberry-apple-blackcurrant juice that I would pay real-world dollars for. Sooo good and tasty, a nice blend of sweet and tart. I received this juice both times I flew this route, and I was thrilled to see it again on my tray. The sandwich, not so much. Though you’d expect that dark, seedy, rich-looking bread to have a robust flavor to match its appearance, in truth it was quite flavorless. Perhaps we can blame the altitude, or the fact that it was served quite cold (urgh). The lackluster bread was filled with equally lackluster ingredients, so lackluster I cannot even recall them properly. Lettuce, perhaps? And a flavorless spread you can just see in that photo. Meh. In summary, the vegan options on SAS exist, but they are not terribly exciting. They are, however, redeemed by a few true highlights: cold-pressed juice and delicious chocolate ganache. Both of those were served on the route originating in Copenhagen, so you can thank European air catering for those. Have you flown a different SAS route? What was your meal experience? To feel so high ?